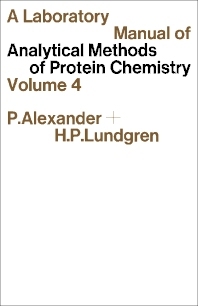 A Laboratory Manual of Analytical Methods of Protein Chemistry, Volume 4 provides information pertinent to the fundamental aspects of protein chemistry. This book discusses the simple and accurate methods of estimating specific proteins. Organized into six chapters, this volume begins with an overview of the composition of acids and experimental conditions for the acid hydrolysis of proteins. This text then examines the advantages of high-voltage electrophoresis for amino acid analysis, which are paralleled by equal advantages in the peptide separation field. Other chapters consider the simple technique of estimating specific proteins, which is one of several based on the phenomenon of antigen-antibody precipitation in gels. This book discusses as well the summations of analyses in weight percentages of the various residues and of the nitrogen of each constituent. The final chapter deals with the electrical properties of molecules. This book is a valuable resource for physicists and research workers.